The Center for Attachment Research (CAR) was established in 2004 with the arrival of Miriam Steele and Howard Steele to the Department of Psychology at The New School for Social Research. The center is engaged in the application of attachment theory to clinical and developmental research questions concerning child, parent, and family development. CAR initiatives involve New School for Social Research, Parsons, Lang, and other New School students and faculty, as well as ongoing collaborations with senior consultants and colleagues in New York and internationally. The Center for Attachment Research is currently engaged in a range of projects. The primary project, supported by funding from — and affiliation with — colleague Anne Murphy at the Early Child Care Center at the Albert Einstein College of Medicine, is an examination of the effectiveness of a Group Attachment Based Intervention (GABI) provided to vulnerable parents. The immediate goal of the intervention is to enhance parental sensitivity, improve parents’ mental health, and promote children’s social, emotional, and cognitive development, diminishing child behavior problems. Increasing attention is being given to enhancing the child-mother, and child-father, attachment relationship to lower risks of child maltreatment. This study is actively recruiting families to engage in interventions as well to serve as comparisons to families involved in interventions. Another area of work at CAR is the study and assessment of children's understanding of emotion and their theory of mind. The study relies on a measurement tool developed by the Steeles: the "Affect Task," a cartoon-based assessment of children’s ability to recognize and understand emotion, including sequential and mixed emotions. With the help of a team of master’s and doctoral students, data has been collected from school-age children in New York and the tri-state area. This aspect of CAR work is closely connected with the Chelsea I Have a Dream after-school program, in which a cohort of children now in middle school have been followed longitudinally since 2005, supporting the children's learning and contributing to the advancement of child development knowledge. A third area of interest is the “Body and Attachment” group, which brings together senior clinicians from a range of interests to investigate intergenerational transmission of body representations from mothers to daughters. Initiated by Susie Orbach and Miriam Steele, this group comprises esteemed colleagues from the Women's Therapy Center Institute, William Alanson White, and experts in non-verbal communication. Two studies are currently being conducted: one involving mothers and their toddler daughters and another involving undergraduate students in a study of the body and objectification. Other interests of the Center for Attachment Research include the use of video-film feedback as an adjunct to therapeutic work with parents and families. This initiative is supported by an ongoing affiliation with George Downing, a Paris-based clinical psychologist who visits The New School twice annually to lead seminars on video-based psychological treatment. Further work concerns international research and applied efforts to improve the lives of abandoned children typically living in orphanages. The wide-ranging applications of attachment theory and research across the lifespan, across generations, and around the world are the focus of discussion at the Center for Attachment Research; CAR consults regularly to other institutions using research tools for which it possesses reliable expertise, particularly tools developed by the Steeles, e.g. "The Friends and Family Interview" or the "Reflective-Functioning Rating Scale" as applied to Adult Attachment Interviews. The Center for Attachment Research relies heavily on the input of students at The New School. 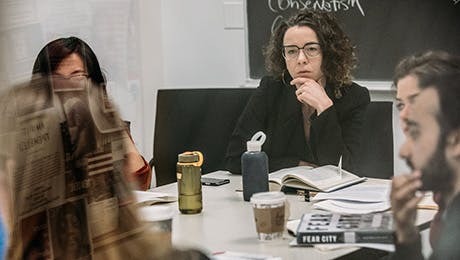 Our research team consists of 50-60 students, including undergraduates at Eugene Lang College and graduate students at The New School for Social Research and Parsons. Students are taken on in an "apprentice" model, where senior students are directly involved in supervision of junior colleagues. Every effort is made to involve all students in the ongoing projects to engage them in the state of the art methodology of the attachment researcher. Miriam Steele is Director of Clinical Training for the PhD program in Clinical Psychology, and Howard Steele is Director of Graduate Studies in the Psychology Department of The New School for Social Research.